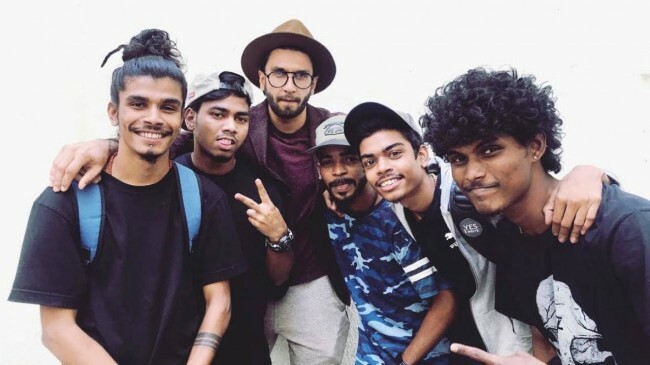 New Delhi, Jan 20 (IANS) “Apna time aayega” is a catchphrase from a “Gully Boy” song that is resonating with underground or street rappers, who hope to grab more spotlight for their talent of “asli hip-hop” once the Bollywood film hits the silver screen. “Gully Boy”, starring Ranveer Singh and Alia Bhatt, is said to be inspired by the life story of street rappers Divine and Naved Shaikh aka Naezy, known for their song “Mere Gully Mein”. Several underground rappers like Vivian Divine, Slow Cheetah, Emiway Bantai and KR$NA are ecstatic as a film is finally being made on the most misunderstood genre of music — rap, which started out as a form of protest music/poetry by African-American performers, or as a non-violent means of fighting against racism, discrimination and ridicule. Divine, whose given name is Vivian Fernandes, began his career as an underground rapper in Mumbai in 2011. He believes the movie will bring a change for underground or street rappers. “Hip-hop is the voice of the streets and ‘Gully Boy’ will take it to every corner of the country,” Divine told IANS. Will the movie help understand the genre of rap, which most people think revolves around parties, alcohol and girls? “I don’t think one movie alone can do that, but it will make people more open to the idea of hip-hop. Definitely more aware,” he said. Rapper KR$NA, who was born in New Delhi and is of Kashmiri descent, is also a part of Zoya Akhtar’s “Gully Boy”. He firmly believes that the film will bring a lot of attention to hip-hop and rap music in general. “The movie will hopefully open up the door for rappers to a wider audience and lift the underground up to a point where there are more opportunities for underground rappers to achieve success,” KR$NA, whose given name is Krishna Kaul, told IANS. Having pioneered socio-political rap in Hindi, the rapper believes the film will shed some light on the effort and skill that goes into being a rapper. Hemant Dhyani, popularly known by his stage name Mc Heam, who has worked with Grammy and Oscar-winning Indian musician A.R. Rahman and Majidi Majid in “Beyond The Clouds”, says rap is too deep to be understood via a film. “‘Gully Boy’ is just the ‘ABCD’ of rap. To understand it better, more people need to study its history in India. It’s just more than ‘gully’,” Heam, who is from Pauri, Uttarakhand, told IANS. Mumbai-based underground rapper Slow Cheetah, who is also a part of “Gully Boy”, credits Bollywood for being instrumental in reaching out to a wider audience and to help them understand the rap culture. “Bollywood is the most powerful influencer in the country. There is nothing which has more reach than cinema and I feel that hip-hop was a subject waiting to be talked about. I also feel like there is something very amazing about the hip-hop culture there is so much to explore,” Slow Cheetah, whose given name is Chaitnya Sharma, told IANS. The singer said every song in the underground has a very grave impact on a lot of things in the society. RAGA, another underground rap talent whose given name is Ravi Mishra, told IANS that he always dreamt about Bollywood being interested in the Indian hip-hop scenes. The New Delhi born rapper, who is oftenly seen representing his “hood” — Jamnapaar — feels “now rappers will get the credit which they always deserved”. He is confident that with the release of the film, “they will get more work and exposure from the industry”.